Progress has been made, but big initiatives are needed to secure Wisconsin’s prosperity. 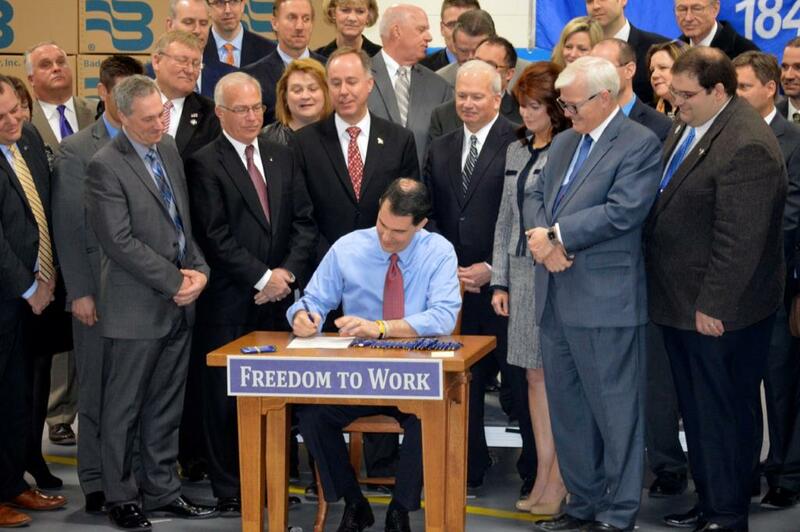 Governor Scott Walker Signing Right to Work Legislation. Photo from Governor’s Office. Even though the Wisconsin unemployment rate has dropped to 4.2% and wages have finally started to move upward, there isn’t an economist or economic developer who doesn’t want a stronger base for the state’s future prosperity. Note: Wisconsin had the fifth best growth – 5.73% — in median household income growth of the 50 states from 2014 to 2015, according the U.S. Census Bureau. It did the best in the Midwest. The 2015 number is surprising, because the state has long lagged the nation on job creation, GDP growth, wage levels and business startups. It still does. The canary in the mine shaft that is most alarming for Wisconsin is the exodus of more than 10,000 college graduates per year, often our kids and grandkids. Despite high state income and property taxes, we are finally out of the top ten for total state and local taxes. Other positives: Gov. Walker accomplished a necessary reset in the balance of power between public employee unions and taxpayers. We are now a right-to-work state. The state income tax on manufacturing and agri-business is being phased out, a tonic for the two pillars of the Wisconsin economy. Tort reform has been passed. And regulatory over-kill has been dialed back. Progress acknowledged, more structural change and reinvention are necessary to move Wisconsin into a top tier state for citizen prosperity. We can’t stand pat. Few say otherwise. And many are waiting for Gov. Walker to kick off some big moves. His legacy over two terms needs to more than Act 10 and holding the line on taxes. So, what would bold moves look like in Wisconsin, if Gov. Walker and his GOP-controlled legislature decided to take on some after the Nov. 8 election? Here is a menu of big initiatives, elicited from different sources, on challenges facing the state. Reorganize the University of Wisconsin System along regional and cluster lines to directly connect its 26 campuses to economic development at the ground level. We need a bigger payoff from our high-ranked investments in higher education. The current Madison-centric model is neither transparent nor even-handed in applying UW talents and resources to the most needy parts of the state, such as rural areas and the central city of Milwaukee. In addition to administrative savings, the regional groups could buy health care locally for much less than the state plan, could institute lean measures, could improve financial transparency, could consolidate overlapping courses and majors, and could coordinate directly with the tech colleges and K-12 districts. Some regions are already part way there. Go right at the state’s challenge with dysfunctional families that largely result from more unwanted pregnancies and single moms than any other state. That is a recipe for generational poverty. LARCs (long acting reversible contraceptives) are having a major impact on the issue in 21 other states. Foundations at the Medical College of Wisconsin and UW Hospitals have the funds to get the initiative going. A LARC program would address the issues of teen pregnancy and high infant mortality as well. Move swiftly to Value Healthcare. With $1.3 billion being spent on healthcare for 65,000 state employees, there are huge savings to be had by moving to Value Healthcare, the new business model at work in the private sector and local government. That means moving to self-insurance, consumer-driven plans that feature higher deductibles and savings accounts, on-site proactive primary care and value purchasing for elective medical treatments. Savings can be as much as 30%. At just 20%, one-quarter of a billion dollars could be shifted to priorities like K-12 and university education. Ask the state’s many foundations to invest part of their portfolios in Wisconsin startups. Five are already doing so. These would not be grants; they would be investments of a small slice of their alternative portfolios at superior returns. Startups reinvent the economy, and they create most of the net new jobs. That’s where the action is. Grants for education, the arts, the environment, health care and other social programs are wonderful, but jobs are the main platform for prosperity. The Wisconsin Be Bold Prosperity Strategy of 2010 called for investing $1 billion in state capital over 10 years for high-growth start-ups. It doesn’t look like those public dollars will be forthcoming, so the foundations may have to step up to fill the void through impact investing. Foundations serving UW – Madison alone have more than $8 billion in assets. Launch a program of loan guarantees for gazelles – high growth startups. Regulators have been pounding on banks to curtail loans to companies with a modicum of risk. The state could embolden banks and regulators to loosen the reins on lending to gazelles by offering partial loan guarantees, much like the federal government does with SBA loans. That arrangement has the virtue of putting seasoned bank credit officers at the point. The Wisconsin Housing and Economic Development Authority (WHEDA) has made some loan guarantees, so there is precedent. Such debt capital would help bridge the “valley of death” that is encountered by young companies as they start to take off, add staff and need working capital. Reform workers compensation pricing. GOP leaders could sharply improve the state’s business climate by allowing employers, public and private, to use negotiated market rates for episodes of care after a work injury. They are now forced to pay rates three times higher than market under the state-controlled pricing scheme. Providers will fight the loss of exorbitant pricing, but reform is long overdue. Another quarter of a billion dollars could be saved for business. Provide workplace learning opportunities for all juniors and seniors in high school. That’s how Germany competes so well. It has high wages and benefits, but offsets those costs with the most skilled workforce in the world. Most young people in Germany have a youth apprenticeship every year. They can choose from many different fields to find out what they like and where they fit. The workplace learning reinforces classroom learning. Some companies in Wisconsin, like Generac and Briggs & Stratton, are stepping up with similar programs. Their examples need to become a widespread, high profile state strategy, with every Wisconsin business stepping up. Gov. Walker could champion that cause. Create a high-level task force to dig into the explosion of Medicaid costs. They are smothering many other state priorities like education and public safety. It is a state-federal program, which makes reform difficult. But the progress on taming health care inflation in the private sector demands a new look. Make clean drinking water a high priority for the state. More oversight is needed to protect our groundwater and public waterways. Wisconsinites don’t want a Flint crisis in their communities. As his lower approval ratings demonstrate, Gov. Walker and the GOP-led legislature need a second act. A prosperity agenda is a good place to start. Why would low approval ratings justify a second act? This piece is the most out of touch, unedited drivel I’ve read in weeks. Drivel is this guy’s specialty. He keeps insisting entrepreneurship in the state is vibrant and just fine despite nothing but evidence to the contrary. He’ll say all the reports ranking us last can’t be right because he sees good things and new companies are created here every year. It’s like claiming fatal car accidents never happen because you’ve never been in one. “We need a bigger payoff from our high-ranked investments in higher education.” (ie UW). Considering the continuing decline in state support of the UW system, at some point the state becomes the minority ‘investor’ and at that time should lose its voice in how the system is run. Isn’t a “prosperity agenda” what Walker ran on in the first place? We’re open for business? It’s been 6 years. If all of those things that Torinus says are positives are so great, why isn’t the state in better shape? Did you guys actually read the article? I suspect not. He explicitly states that growth here is surprising, given that the state lags the nation in GDP growth, wages, and startup activity. Many of the suggestions are reasonable. Most of the priorities are centered on job-creation. There are two specific suggestions on how to help the dire state of entrepreneurship in Wisconsin – having foundations invest part of their alt portfolios in small businesses, and have the state guarantee loans for new high-growth companies. In facy, I’d argue that much of this list (which, it should be noted, Torinus didn’t single handedly create) is a target for every future state governor. I respect some of the author’s opinions as expressed here and on his website / blog, but he is still sadly behind current society considerations when it comes to developing “prosperity” and securing high-income jobs. He tends to focus on low-paying jobs and can’t ever understand why people won’t move to West Bend to take $10-$12 an hour jobs in light manufacturing. When you look nationally and even in Wisconsin at the places that are “prosperous” (such as Madison) the model is to create a society and community that attracts the creative class who then create and support the start-up and entrepreneurial opportunities that generate new income. Yes, investment is needed in education and health care. But it is also needed in community facilities, public transit, the arts and other services to attract and keep those educated, healthy people. Well-educated and healthy millenials leave Wisconsin to go to the types of communities they enjoy – even if they don’t have a job lined up. Today’s generation picks the location first, then finds a suitable job (or creates a start-up) once they get there. It’s a paradigm shift that the Wisconsin proponents of the old economy just don’t understand (because it’s not how they did it in their time). Higher deductibles? Why not just do away with healthcare for the middle class? There are hard working people already avoiding much needed healthcare due to higher and higher deductibles. Nonsense. Governor Walker’s approval ratings have been improving rapidly here of late in the Marquette poll, indicating that he may have some more political capital to spend before he seeks out his next term. @WashRepub…was that ever really a policy proposal? Really? Or just another talking point for cutting our way to prosperity? And in regard to political capital…he’s overcharged the credit card, and we’re going to have to pay. And Torinus and the MMAC (whose PAC has given Republicans max donations in this election cycle) thinks things are working under Walker? REALLY? What kickbacks are they getting to back these bums (and is the “Value Healthcare” part a clue)? This is why no one worth a darn will live in a place like West Bend. Because it’s run by mediocre businessmen by Torinus, and overrun by dead-end garbage like WashCo Repub. I just wish the politicians those rubes voted for weren’t in power and running the rest of the state into the ground. A second act. Hillary needs to place in her wanted ads for new secret service agents, must be able to lift paralyzed body into black SUV. Jason that is some nice misogyny in a story about Scott Walker. You are a class act. Not only misogynist, Vincent, but weak-minded, needy Jason is also way off topic.Typical rightie reaction when they can’t defend the garbage that is today’s GOP. Jason- THIS IS ABOUT THE FAILURES OF SCOTT WALKER ON THE ECONOMY. C’mon hotshot, tell us how “it’s working” in this state as we continue to lose jobs in year 5 in Fitzwalkerstan, and the University of Minnesota student newspaper is writing articles about how so many UW faculty members are leaving for a state that properly values them. I know you have a hard time relating to this, but people with talent have options on where they can work. What has Walker or WisGOP done in the last 5 1/2 years that would make anyone with game and self-respect say “I want to go to Wisconsin and raise my family there”? Jake, I don’t disagree with you. It is hard to replicate San Francisco, Seattle and Miami in Podunk Milwaukee. I do think it is short sided to not include Obamanomics in grading Walker. These ideas are right out of the ALEC play book. Is John a member? The failure is Walker’s and WisGOP’s alone. Grow up and OWN IT. Dear Lord, kiddo. Get some self-respect and pride, and stop making a fool of yourself by waving those red Pom-Poms. Why a second act? Because Scott Walker asked. Max — Good one. Thanks for the laugh. Yeah. I think they call it the Reception Center at Dodge Correctional (in an orange jump suit). Mr. Torinus and I agree on one thing: the extreme importance of contraception although I believe it should be easily available to all, not just ‘dysfunctional’, ‘generational poverty’ people, whoever those folks might be. My usual choice of phrasing – ‘We should hand it out like candy at Halloween’ illustrates why he’s the writer and I’m not. But why would he think this is even a possibility? It’s not just Scott Walker who would never consider such a thing. Has Mr. Torinus not noticed that you can’t get elected in most parts of Wisconsin without glossy campaign literature showing your picture with your spouse and five children in front of the altar of your church? And including the phrase ‘100% pro-life’? Perhaps Mr. Torinus should push for free contraception in the catastrophic-only insurance policies he seemed to be describing in another section of the article. He mentions a 5.7% increase in Median household incomes. Does anyone know How they caculate that figure? (either an explanation or a web address with the information would be fine.) I ask because if you add a number of minimum wage jobs to the state payroll, and those people were earning nothing, I could see how that would exagerate that figure, something walker and his sponsors are so often guilty of. Was this written as an article for the office newsletter at Wisconsin Manufacturers and Commerce? Any op-ed that speaks glowingly of the ongoing criminal enterprise that is Walker’s WEDC is clearly crafted by someone with a right wing Koch brothers agenda. The only thing worth salvaging from this drivel is the suggestion of increasing the availability of birth control to sexually active teenagers. Now come on Torinus, do you really think Walker and his minions will dare to offend their one consistent support group,the pro-lifers, by offering realistic family planning to poor people? This is the Governor who put two people on the Wisconsin Supreme Court who believe that birth control is murder (Bradley and Kelly). As I’m sure you are aware, I have been under assault by the Guardian as well as other leftist news organizations, organizations that are determined to shine a light on a variety of my clandestine activities. John, I need your help. No, I’m not going to ask for a bucket of cash to be secretly funneled to one of my dark money conduits … well, not now anyways, that request will come later. What I’m asking for now is for you to put a bit of polish on what can only be described as one big stinking turd of a news cycle. John, I know you’ll come through for me, you always have in the past. Thanks in advance for spinning my pile of crap tenure as governor into a delicious chocolate mousse. How about mortgaging our children and grandchildren’s financial future by taking out bonds to pay for new and/or expanded freeways when our existing ones badly need repairs? That’s not fiscally sound. The scope of the borrowing is incredible and just kicks the can down the road for our next Governor to solve. Median household income in Wisconsin last year was still $2,179 below the inflation-adjusted value in 2007, a drop of 3.8 percent (which is the same as the national decline). There were about 678,000 Wisconsinites living in poverty last year, and although that’s significantly below the number in 2014, it’s about 90,000 above the number in 2007, prior to the recession.